How Many People Can You Have in the Delivery Room? Today's labor and delivery room is open to more than just the mom and her partner. Many families choose to bring other people including a doula, a friend, grandmas and more. So, the question becomes: Just how many people are you allowed to have in the delivery room when you give birth? How many people you can have in the delivery room will largely depend on your hospital's policy. A fairly normal policy states that you can have three people in the room. This may also vary depending on the room you are in within a hospital. Some rooms might accommodate bigger families. That said, the policy is more about your safety than annoying you. Though there are plenty of places who only allow two people in the room. Some hospitals also have a policy that you can have a different number of people in the room during labor versus when the baby is actually being born. This makes sense on one hand since during the birth some of the available space will be taken up with hospital personnel. You may also have your guests asked to leave during certain procedures like vaginal exams or the placement of an epidural. This is definitely a question to ask when you are taking a hospital tour. You will also want to ask if this number is different if you have a c-section. "It didn't occur for me to ask how many people we could have during the birth, I just assumed that was included in with the labor parts," says Amanda. "Low and behold, I start pushing and a nurse is asking me who is going to leave. I was clueless. I hadn't thought of it. Thankfully the baby came relatively quickly and I wasn't forced to make a decision and everyone got to stay." Some hospitals will allow you to have one person stay with you during the administration of an epidural, while some will not. We have one hospital locally who will allow your doula to stay while an epidural is being placed, but not the partner. The hospital policy may vary widely even in one area., while some will not. We have one hospital locally who will allow your doula to stay while an epidural is being placed, but not the partner. The hospital policy may vary widely even in one area. 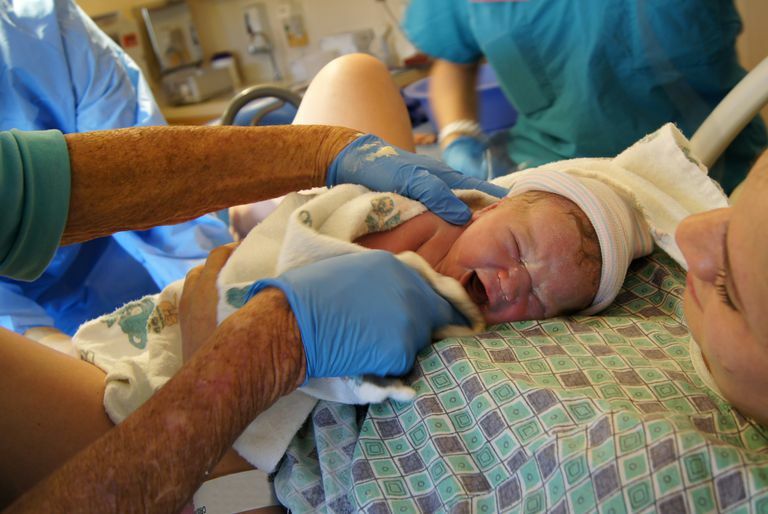 The vast majority of hospitals only allow one person in with mom during a c-section. Though some hospitals are a bit more lenient with a second person if that second person is a doula or another medical professional. Other people may not be allowed if you require general anesthesia. "My husband and doula were going to come back during my cesarean," says one mother. "Then it was determined that I would need general anesthesia and they both had to wait outside. I woke up with both of them with me and the baby in the recovery room." If you are planning birth at a birth center or home birth, you will want to talk to your care provider. Some birth centers will have limits but others do not. At a home birth, the limits may be only on what your space will comfortably handle. That said, just because you don't have limits, doesn't mean that you should fill the space to the gills. There are many things to think about before inviting people to the birth, including your children. Some hospitals and places of birth also do not count a human body as a person. Two of the biggest examples of this are policies that do not count your partner and/or your doula in the allowable accounting of people. This can vary from hospital to hospital and is something you should ask when you take a tour. Simply having people to have people at your birth might backfire on you. You will want to ensure that those there are people that you feel comfortable letting loose and making noise and talking bodily functions around. Alice Turner, a doula and childbirth educator in Atlanta, talks about the criteria she suggests for visitors at birth, "Even the most well-meaning visitor can impact your labor."